Greenstreet Coffee Co. Brew School = SUCCESS! This past Wednesday, we held our first coffee brewing class here at 11th and Spruce. Greenstreet Coffee Co. Brew School is our new series of classes in which we teach YOU how to brew Greenstreet coffee by some less conventional methods. Our first class was “Full Immersion 101” covering French Presses and Vacuum Siphons. It was an overall success. Jeremy, cafe manager and super barista, led the class, opening up by demonstrating one of our most popular in-house methods, the Siphon brewer. 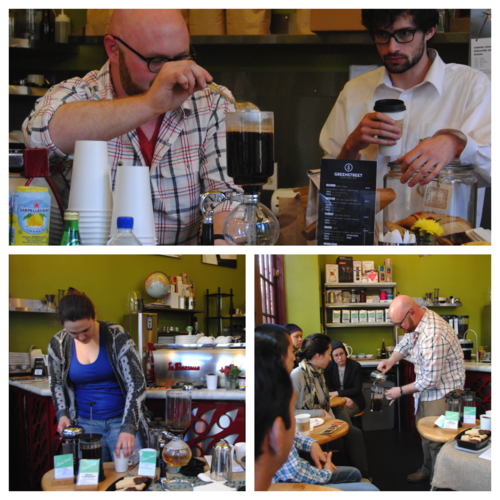 The class attendees got to try two different Greenstreet coffee brewed in Siphon pots. Following the Siphons, we jumped into French presses, which was a little more hands-on. With five french press pots, we gave everyone the option of coming up and being the barista, brewing a fresh pot for everyone to try, totaling five different Greenstreet coffees. Everyone got to try our popular coffees side by side and enjoy some fresh baked goods. Some even went home with a bag or two of their favorite Greenstreet coffee beans. We’re sending a big thanks to everyone who came out to brew school! Everyone had a great time and left well-caffeinated. Sorry you missed out on the fun? Our next brew class will be Wednesday, May 7th at 6pm and we’ll be learning all about cold brew and Chemex! This time we’ll get to hold the class outside and enjoy the warm weather and coffee simultaneously (weather permitting). Hope to see you there! Top: Jeremy demonstrates brewing coffee with the Vacuum Siphon Pot. Bottom left: Brew school attendee, Liz, gets her hands on French press to brew up a fresh pot for everyone to sample. Bottom right: Jeremy explains the importance of pouring water to the correct level to allow the coffee to bloom. How can I join the next brew school class on May 7th? I’d love to participate! Hi Holly! Just send an email to jbehne@gmail.com to confirm, and you’ll be all set!